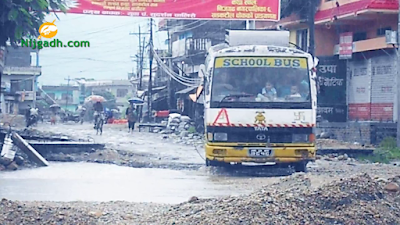 The Most Popular highway Mahendra Highway of Nepal is Damaging day by day. Mahendra Highway's total length is 1,027.67km. In Nijgadh Mahendra Highway at the center of Sahidchowk Nijgadh Bara get damaged from few years but still not cons Sadak Bivag tructed yet. Local people and long tour vehicles too. Many accidents happens here but still not constructed yet by Sadak Bivag. here i captured some Video of Nijgadh Sahidchowk to show you all. Please Spread this video to all you may download it but please Kildly do not re-upload it again.